In its latest exhibit, Frye Art Museum continues a previously establish bi-focal approach, opening concurrent shows that explore classic and contemporary works in neighboring galleries. In one gallery, we have a survey of works by the 20th century Russian-American painter Nicolai Fechin, curated by Frye director and scholar Jo-Anne Birnie Danzker. Several of these paintings—many of them darkly Impressionistic portraits of handsome ladies—live in the Frye’s permanent collection. But the exhibit also introduces works that have been spread, for decades, across private and public collections in America and Russia. To serious Fechin scholars, this show is the equivalent of a Beatles reunion at Benaroya Hall. Nicolai Fechin was something of a rock star in his day. In this age where imperfecting images on Instagram is en vogue, Fechin’s painting style may not look terribly revolutionary (more like something that’s already been screen-printed on an umbrella). 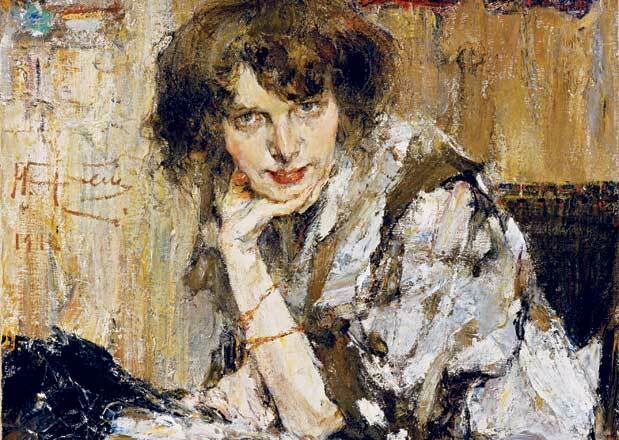 But according to the Frye, when Fechin started gaining popularity as a painter in 1909 (he was only in his twenties), he was using brushstrokes and paint in ways his audience wasn’t familiar with at all. Some called it barbaric. Some called it beautiful. I love the way Fechin seems to capture people in mid-breath. Their postures and facial expressions are comfortably, not stiffly, posed. The paint around the eyes is layered in such a way that it creates the look of a blurred photograph from one angle, and a sort of shine from another. Add the way subjects’ smooth faces emerge from dark patchwork backgrounds—it’s haunting and sometimes playful, as in, “Come hither.” Every subject is dignified, natural and refreshingly approachable. You don’t get the sense you are facing off with an aristocrat. You might have known these people once. In a separate gallery, we have the first exhibit at the Frye to be curated by its new director of exhibitions, local art wayfarer Scott Lawrimore. Chamber Music tasked 36 local artists (a complete list of their names here) to supply one work, each a response to existing musical compositions based on James Joyce’s collection of poetry entitled Chamber Music (1907). Integrated into this piece are benches you can sit on and “cubby holes”—one for each participant in the show—where artists have displayed their own interpretations of a living archive related to their work or contributions to the community. Visitors are encouraged to explore these and examine the pieces inside. Some artists displayed stacks of art show catalogues, file folders or stacks of photo copies from research. Some crafted dioramas that seem too precious to investigate. One features, I think, an antique bed pan. Many are funny. I strongly encourage reading the short, one-act play Amanda Manitach offered up as her archive. You, the viewer, star in a leading role. Stand-outs for me among the artwork on the walls were Klara Glosova’s stirring and sad ink drawing “Heisastrangertomewhowasmyfriend”; Robert Campbell’s clever import of a landscape painting into what looks like a drawing of a video editing program in “V”; and Rafael Soldi’s barely-there photographed portrait in which the subject, almost the same pigment as the background, is more memory than image. Looking at the parallels between the 36 artists’ work on the walls and the items in the cubbies is an adventure in extra credit. You can derive more understanding of the work they chose to display. You can also get a little bogged down in the homework of it all. My advice is to not worry too much about the prompt that got the artist there—just enjoy what they have brought you. I enjoyed thinking about what Fechin might have put in his cubby, had he the opportunity. In his lifetime, the artist and his family were touched by world war, famine, disease and were separated from each other and their homeland often. In spite of that, Fechin painted. He just moved through his life, painting and drawing prolifically—and through it all he contributed something to his community that gave it great pride: a vision of beauty, of identity, of international renown and maybe even something like hope. From that perspective, the work in Chamber Music represents something so much more important than a clever idea for an exhibit. I'm glad the "double vision" approach of these neighboring shows could help me see it.